Thursday, February 11th, 2010 | 9:04 am	and filed in Synthesizers, Tutorials, Record. Last year, I posted a few items on using Reason CV/Gates to control analog synths through a MOTU audio interface, and recently, I’ve received an unusual amount of email inquiring about the concept of controlling analog synths via Record. I figured it’s about time that I should post this, a Record session file with a MIDI to CV/Gate/Mod converter that works ‘volta’-style to control a minimoog voyager. This patch is calibrated to work with a MOTU 896HD firewire interface and will probably not be tuned with anything else. To use this session you need Record + Reason 4, a MOTU 896HD, a Minimoog Voyager, and the proper cables. Surprisingly I’m not alone with this setup! The connections between the 896HD and the Minimoog voyager are made using XLR to TRS cables with the Ring contact lifted and with XLR pin 3 shorted to ground. XLR Pin 2 corresponds to the TRS jack’s tip contact. Three cables are used. One cable connects from an audio channel to the Minimoog gate trigger input. One connects to the pitch modulation input, and the third connects into the filter modulation input. This configuration has not been tested with a VX-352 CV Expander or the rack mount voyager. On the Minimoog Voyager, switch the Envelope mode to ON/External. Also, press Middle C to set the base pitch. The incoming CV value merges with the instrument keyboard value, so press middle C to inhibit any transposition. Tuning is tricky because it involves finding both the proper intervals as well as the correct pitch. This requires some tweaking to get it right. First open up the combinator patch and access the Thor Programming matrix. On a keyboard controller, play octave intervals into the combinator, and adjust the MOD Destination Amount settings on bus 1 and bus 2 until the intervals sound like full octaves. For this patch, Mod Dest Amt 1 is 99 and Mod Dest Amt 2 is 33. This seems (for my setup) to yield very tight octave tuning over 5 octaves. You can route audio from the minimoog voyager back into a Record Audio Track, and monitor the pitch using the input channel tuner. You might run into a problem of the track focus closing the tuner when you switch the sequencer track. To keep the tuner active, arm the audio track for recording, and then set the focus on the MIDI track which should also be armed for sequencing. Watch the tuner and start dialing in the exact pitch. Once the octave interval tuning is set or even close, use the Thor Rotary 1 to introduce a gross tuning offset. As the pitch gets close, use the Mod Dest Amt 4 parameter to control a fine tuning. You can also use the minimoog voyager fine tune control. Again use octave intervals on C, E, G, B to make sure the interval scaling is correct, then go back and make fine tuning adjustments on the Mod Dest Amt 4 parameter. Once the key scaling is set and the the tuning aligned, then you can sequence the minimoog voyager as you would any of the Reason synthesizers. 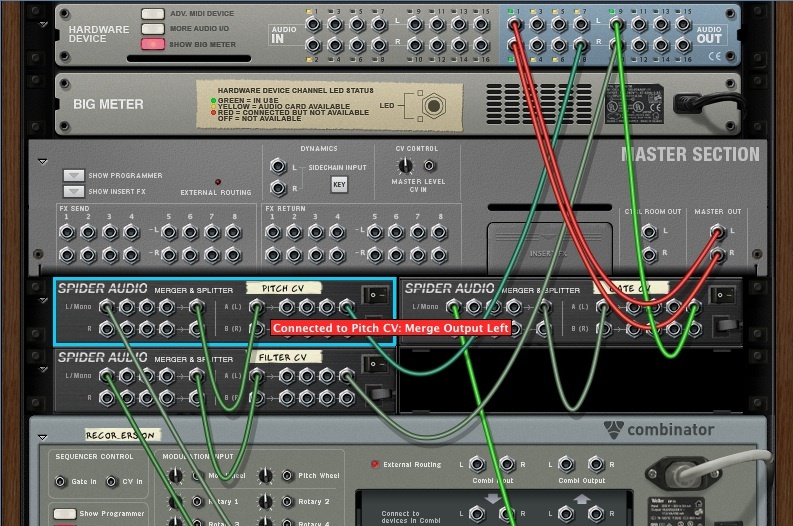 You can also connect a Matrix Pattern Sequencer or RPG-8 Arpeggiator to the Combi patch and drive the synth as you would one of Reason’s virtual instruments. After the arrangement is complete, you can then Record the minimoog voyager track in Record.